Based on your body, your allergies and intolerances, and your dietary preferences. Dietless has a bank of 300+ recipes all crafted by experienced nutritionist and chef Erik Orgu. All our recipes are delicious, quick and tailored to your specific dietary requirements. Taking one day at a time, we help you transform your life through healthy eating. A classic easy to make dish that will never let you down. This fruity porridge and classic cottage cheese salad will kick start your day. These guilt-free pancakes are a popular favourite! Plus peanut butter is the perfect fuel for an active day. Prepare a simple and healthy Caesar salad. Like you’d find in a restaurant. Feel like adding a French twist to your morning routine? This Croque Madame sandwich will deliver. A classic taste of England, but rich in flavour rather than just fat. The last time you had a stodgy burrito you might have regretted it! After eating this one, you’ll only regret not making more. A surprising and enjoyable harmony of sweet oatmeal and salty bacon. Addictive! Simple, tasty, and healthy. A nutritious autumnal dish that will set you up whatever the weather. The potassium, iron, probiotics and other nutrients in this delicious smoothie will enhance your sense of well being. If you have high expectations for breakfast, then delicious shrimps, cottage cheese and crispy rye bread will definitely satisfy them. Golden chanterelles, fluffy baked potatoes and delicious mince is comfort food with a twist. An attractive combination of feather-light summer flavours of which you’ll never get tired. Among our most popular recipes! Quick and a lot healthier than anything you’ll find pre-prepared in a shop. Who says that healthy eating has to be bland? This sweet recipe will tickle your tastebuds. A flavour explosion that will leaving you feeling energised and ready for your next challenge. Give yourself a taste of Thailand with this aromatic dish. Without having to even leave your home. Sometimes you just need something gentle and comforting. This recipe is the perfect choice. This recipe will soon become a firm breakfast favourite, offering the perfect balance of sweetness and crunch. Dump any preconceptions you have about this Italian favourite: this delicious creamy dish is healthy and delicious. If you love pancakes and bacon, then say hello to your new favourite dish! 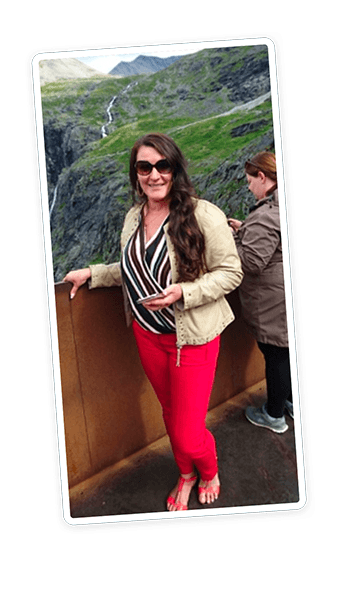 We create a delicious meal plan just for you after guiding you through seven key questions ranging from your weight & height to food groups you can't eat. We also make it easy for you to substitute recipes and ingredients that don't appeal, for added flexibility. Dietless has partnered with many major supermarkets, coffee chains and restaurants so you can eat out without having to study packaging. Or having to settle for something that isn't very healthy. Just tell us what meal you want to eat out and we'll suggest some tasty options. With Dietless, you can add family members - including their dietary preferences - and we'll automatically generate a shopping list that takes everyone into account. That way you can plan nutritious meals for everyone. 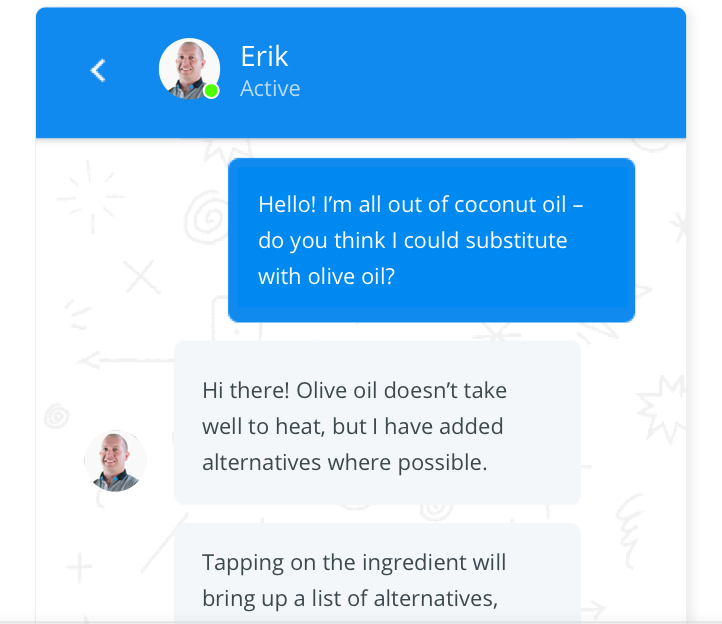 After years of research into the science of food, with a particular focus on food sensitivities, intolerances, and allergies, Erik created Dietless. It is a scientifically proven way to eat and live healthily, no matter who you are and what you need. For motivation, fun facts, and more about the science behind Erik’s meal plan, read the Dietless blog. I'm loving how I can enjoy different vegetables and new flavors which I previously knew nothing about. Amazing I haven't had to give up much really, other than wheat and sugar, which can actually be substituted with other ingredients. Thank you, Erik, for teaching me to eat properly! Thanks to you I've lost 24kgs of baby weight and I feel great. Contrary to my prejudices, it has been much easier to get started with Dietless than I thought. I no longer have to worry about what to eat and what to buy from the shops: this is all done for me. Great! I also feel more motivated now: everything is possible if you want it to be be. And who says you’re getting old past 40 and 50? With proper nutrition and moderate exercise you can delay the ageing process for years! Sometimes we all need advice or encouragement. This is why Erik is always available to help with questions. Our private Facebook group is there for you to swap stories and tips. Let’s go the distance together! If you have a question regarding nutrition, a technical issue, or maybe you just want to say hi – our customer support team is only a clicktap away. Dietless is free to try for the first five days. No obligation, no credit card required. All plans come with a 14-day money back guarantee. print out the shopping list via the “print” button found on the App website https://www.dietless.co.uk in the Shopping List tab for intended and perceived non-commercial purposes only. You must not otherwise reproduce, modify, copy, distribute or use for commercial purposes any Content without the written permission of Dietless Ltd or Dietless OÜ. 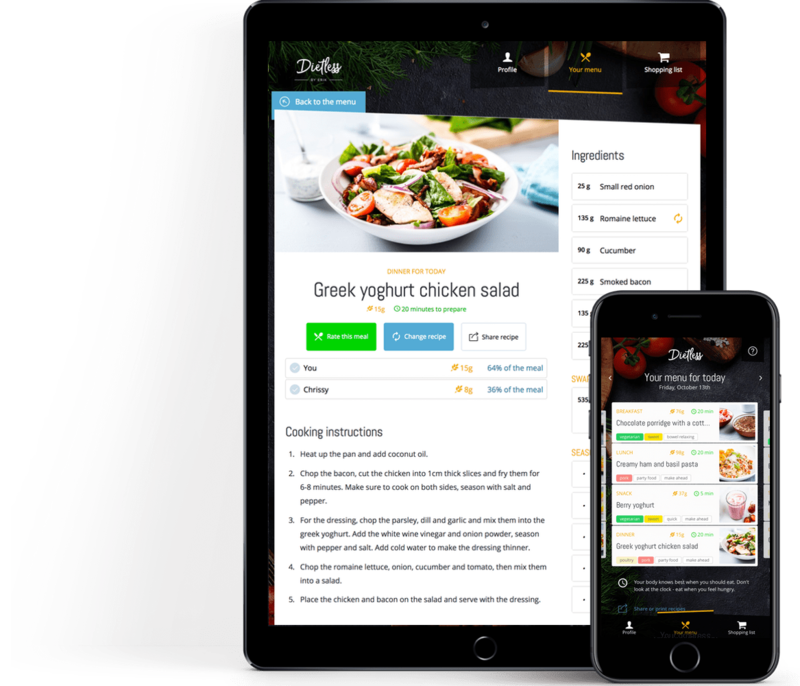 Dietless Ltd provides personalised Internet- and mobile platform (iOS, Android) based nutrition advice in the form of recipes and general guidelines. You are solely responsible for your own health. Dietless Ltd recommends obtaining professional or specialist advice before taking, or refraining from, any action on the basis of the Content on our App or its website. Dietless Ltd does not provide medical services and nothing on the App or its website shall be construed as promises of any medical or health-kind nature. The purpose of the App is to help Users manage their eating and to track their weight. Always consult with your doctor if you experience any pain or discomfort when using the App. Your subscription, including your e-mail, to “Dietless by Erik” is personal and may not be transferred or used by someone else. You are responsible for safeguarding your login details. Dietless Ltd only operates with a limited variety of dietary exclusions. You are solely responsible for disclosing your dietary exclusions. Should you have a dietary exclusion that is missing from the options provided by Dietless Ltd, we urge you to not use the App. You are solely responsible for any injury or damage undisclosed dietary exclusions. The App may contain links to other sites. Unless expressly stated, these sites are not under the control of Dietless Ltd or that of our affiliates. The App is available to the User for the total duration of unpaid and paid subscriptions to “Dietless by Erik”. The App is made available to all new Users for free (unpaid subscription) for the duration of the 5-day trial, after which the User may still retain restricted access to the App. 6-month subscription with one-off payment – 74.99 GBP. If you have subscribed to a payment plan and you are not satisfied with your purchase, you may cancel your purchase within fourteen (14) calendar days of initial purchase by notifying the “Dietless by Erik” customer service (contact details are found at the bottom of this document). You do not have to provide a reason. We will fully refund your purchase within fourteen (14) calendar days of receipt of your notice by using your original payment method. Dietless Ltd reserves the right to change the subscription fees from time to time. All payments in the App are processed by Stripe (https://stripe.com/gb) and its global affiliates. Any online facilities, tools, services or information that Dietless Ltd makes available through the App (the Service) is provided "as is" and on an "as available" basis. To the maximum extent permitted by the law, we provide no warranties (express or implied) of fitness for a particular purpose, accuracy of information, compatibility and satisfactory quality. We give no warranty that the Service will be free of defects and/or faults, nor that our App, or any Content on it, will always be available or uninterrupted. We may suspend or withdraw the availability of all or any part of our App for business or operational reasons. Moreover, Dietless Ltd is under no obligation to update information on the App. Whilst Dietless Ltd uses reasonable endeavours to ensure that the App is secure and free of errors, viruses and other malware, we give no warranty or guaranty in that regard and all Users take responsibility for their own security, that of their personal details and their computers. Dietless Ltd accepts no liability for any disruption or non-availability of the App. You use the App at your own risk and are solely responsible for all activities on your account. We are not in any way responsible for any loss or damage caused by unauthorized access to your account or use of your login details. In cases of unauthorized use of your account, you must immediately inform the “Dietless by Erik” customer service (contact details are at the bottom of this document). Dietless Ltd cannot guarantee that the nutritional information provided in the App is accurate, reliant or complete. To the maximum extent permitted under applicable law, Dietless Ltd’s aggregated liability for any direct damages shall be limited to the lesser of: (a) subscription fees paid by the user; (b) 180 GBP. Dietless Ltd is a company registered in England & Wales, with company no. 10645545 and registered offices at Salisbury House, London Wall, London, United Kingdom, EC2M 5QZ. 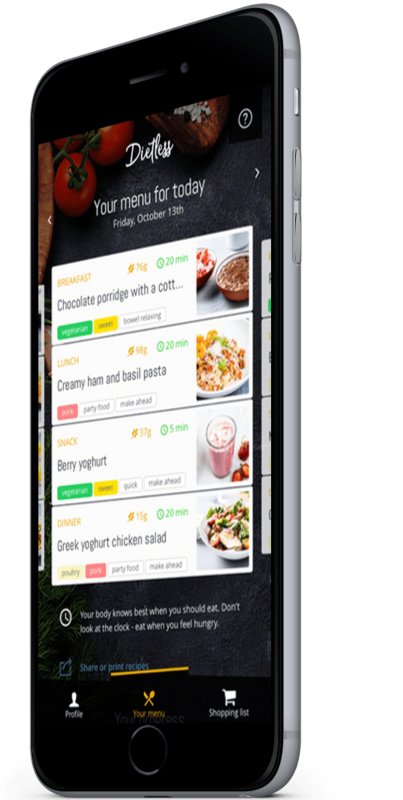 Dietless Ltd operates the App “Dietless by Erik” (iOS and Android mobile applications, and website https://www.dietless.co.uk). You can contact Dietless Ltd by email on info@dietless.co.uk. 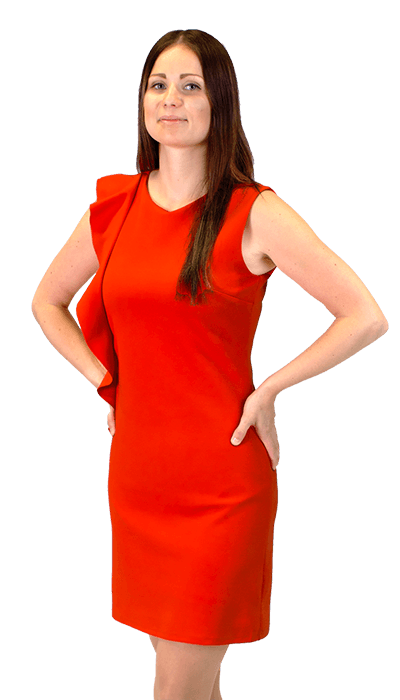 For the purpose of the Data Protection Act 1998 (hereinafter: Act), your personal data is processed by (data controller) Dietless Ltd, registered in England & Wales, with company no. 10645545 and registered offices at Salisbury House, London Wall, London, United Kingdom, EC2M 5QZ; e-mail: info@dietless.co.uk. The nominated representative for the purposes laid out in the Act is Erik Orgu (erik@erikorgu.ee). limited number of third parties, including Stripe and its global affiliates (for the purposes of payment processing), analytics and search engine providers, business partners and sub-contractors for the purposes of any contract concluded with them. You may always turn to us and ask us to stop processing your personal data, entirely or in part. You can exercise that right at any time by contacting the “Dietless by Erik” customer service at info@dietless.co.uk. You acknowledge that this may result in significant changes to the provision of our service, including the discontinuing of your subscription in case we are unable to keep providing the service to you without losing the required level of quality of substance. We reserve the right to change this policy at our discretion. All changes we make will be disclosed on our website https://www.dietless.co.uk.